Steelex Plus - Countersinks - 1/4"
These single flute countersinks are machined from carbon steel and come in your choice of six different diameters. All have a 90 degree angle on the point for sharp and precise countersinking. The cutting edge is hardened and honed for sharpness. Single fluting gives the added advantage of less vibration and chatter resulting in a smoother cut.For use with wood and plastic. These single flute countersinks are machined from carbon steel and come in your choice of six different diameters. 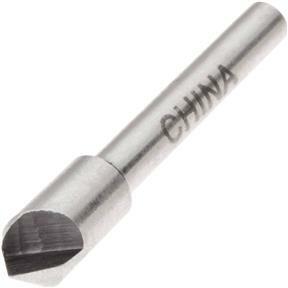 All have a 90 degree angle on the point for sharp and precise countersinking. The cutting edge is hardened and honed for sharpness. Single fluting gives the added advantage of less vibration and chatter resulting in a smoother cut. For use with wood and plastic.